This image is a copy (colors modified) of a Giemsa blood smear obtained from the blood of a 40 year old female 3 years of persisting low grade fever despite appropriate antimicrobial therapy. Human Babesiosis, infection with B. microti was reported first in the 1960s. B. microti is still around, but most cases of human babesiosis are caused by another parasite(s) Three other species of Babesia are recognized by the CDC as known causes of human babesiosis in the US: B. microti, WA1 (B. duncani), MO1 and CA1. These parasites are nastier and are much more common (at least WA1). One study in 2011 found that 2% of the general population tests positive for B. duncani. Over 100 species of Babesia are known, many of which are known to cause animal disease only. Deer ticks and lone star ticks carrier many unknown Babesia species. In Europe B. divergens is a recognized cause of human babesiosis and considered more severe than human disease with B. microti. This bovine parasite made the jump from cattle to humans proving the notion that such shifts occur in nature. Babesia are malaria-like. They are pleopmorphic one cell protozoans, eurcaryotes (defined nucleus) which parasitize host red blood cells. The parasites have a complex life cycle. Sexual reproduction occurs in ticks (genetic material exchanged) and only asexual reproduction occurs in the host. As with malaria, both genuses (Plasmodium vs Babesia) have the habit of rapidly becoming drug resistant. Malaria is widely recognized and considered one the most serious public health threats globally. Malaria infects 1/3 of the world's population, frequently announces it presence with acute high fevers and shaking chills and kills more than 600,000 yearly. Babesia is less lethal and more subtle. The incidence of infection and with which species is unknown and the subject remains uninvestigated. Guilt by association. Babesia shares a common fate with its accompanying Lyme: dismissed and ignored by mainstream medicine. Babesia symptoms are nonspecific -- but not really. Remarkably, the symptoms of night sweats, sometimes fevers, air hunger, depression with weepiness (and others) are dependably seen. Babesia should be suspected with persisting low grade fevers. Most patients are diagnosed clinically because laboratory testing is unreliable, unavailable and expensive. Nonetheless, my policy is to test -- even in the absence of typical symptoms. Results are sometimes surprising. For example, I recently found parasites in the blood cells of a man suffering with early onset dementia and all other tests were negative or ambiguous. Antibody testing for B. microti is widely available. Unfortunately this is the rarer and milder version of the parasite. Testing for WA1 antibodies had suddenly become much more difficult. IFA (immunoflorescent antibody) testing has been more popular than the classic ELISA test. Similar information is obtained. Positive reactions are tagged with molecules that literally glow in the dark when viewed under a special microscope. The FISH (florescent in-situ hybridization) test offered by IgeneX is another option. Here the genetic structure of the parasites are tagged making the whole parasites glow in the dark. The test may not work for organisms of unknown genetic makeup. PCR tests pull out the parasites with a probe of primer DNA which binds the parasites and makes many copies. PCR also only works when the genetic structure of the parasites are known ahead of time. I think the first line test is a blood smear. You don't have to know the species or DNA ahead of time. This does require a CLIA certified blood parasitology lab. The limiting factor is that the samples need to be prepared immediately otherwise parasites rapidly degrade and become more difficult to find. My 40 year old patient has suffered with chronic fatigue syndrome and disabling chronic pain. Prominent symptoms include depression, headaches, joint/muscle pain and cognitive impairment. Her quality of life has been very poor. Symptoms have tenacious in the face of aggressive treatment. Standard antibody tests for B. microti and B. duncani have been negative. Two prior blood smears, a year apart were negative. Recently we found the above result. An active area of red blood cell parasites is clearly seen. Without PCR the result cannot be speciated. But since she suffers with tickborne illness and she has not travelled outside the US it is a pretty good bet she has babesiosis. Armed with this new finding, I ramped up the doses of anti-Babesia therapy beyond standard doses and combined several drugs in cocktail fashion. Finally, after years, the fevers are gone. A vexing problem is that Babesia species, knowns and unknowns, have become increasingly difficult to treat because of widespread drug resistance. Creative, complex drug cocktails are increasingly becoming necessary to treat this frequently virulent and persistent pathogen. Western Blot are frequently equivocal. The results shown above are quite clear. 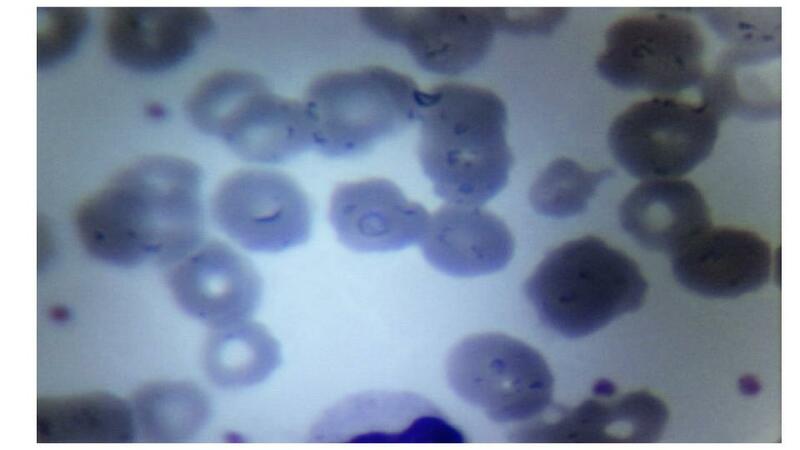 I am consistently able to find evidence of Babesia-like parasites in about 25% of my patients. In patients with soaking night the incidence is much greater. (I can only tests patients seen in my practice). I suspect most of the unknowns are WA1. I have found that patients may seroconvert after treatment.